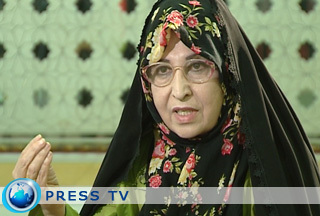 Presidential hopeful Mir-Hossein Mousavi's wife, Zahra Rahnavard, is going to file a complaint against President Mahmoud Ahmadinejad. Rahnavard told Press TV on Friday that she would file a complaint against the president unless he formally apologizes to her family for violating their "privacy", to her for "spreading false information" and to the Iranian nation as well. "If the President does not apologize within the next 24 hours, I will file a compliant against him," she added. In a Wednesday debate with his rival Mousavi, President Ahmadinejad accused Rahnavard of studying at two universities at the same time while she was a government employee, receiving two master's degrees and obtaining her doctorate without an entrance exam. In his wife's defense, Mousavi said that Rahnavard had studied for ten years to receive a doctorate and hit back at Ahmadinejad for adopting "an immoral strategy" by the move of attacking a candidate's spouse. Rahnavard had earlier welcomed any investigation into her master's and Ph. D. degrees. "I urge those who are doubtful about my degrees to gather factual information," Qalamnews website quoted Rahnavard as saying. "Character assassination is in contrast with Islamic ethics," she added. The son of a former Iranian official criticizes President Mahmoud Ahmadinejad for leveling 'unfounded accusations' against him in a fiery presidential debate. In an unprecedented move in Iranian politics, the incumbent president during a debate with his rival Mir-Hossein Moussavi accused Mostafa Nateq-Nouri and a number of other former officials of fraud and financial corruption. Nateq-Nouri said Ahmadinejad ignored the "principals of faith, religious emphasis and behavioral regulations" when he leveled "the strong accusations against me and my family in the face of millions of people". In a letter to Moussavi, Nateq-Nouri praised the presidential hopeful for his stance against Ahmadinejad and predicted a "green" victory for him, saying with "a little patience dawn would be near". Former Iranian president and head of the Assembly of Experts Ali Akbar Hashemi Rafsanjani also hit back at Ahmadinejad for leveling accusations against his family, requesting airtime to defend his honor in a letter to IRIB. The letter described the debate as "constant accusations made by, and lies spread by Mr. Ahmadinejad about Mr. Rafsanjani and his children". The incumbent Iranian president will run against the country's last prime minister Mir-Hossein Moussavi, former parliament speaker Mehdi Karroubi and Secretary of Iran's Expediency Council Mohsen Rezaei in the 10th presidential election scheduled for June 12.